Those who have met me might know that I am relatively clueless about fashion trends. I have my old wardrobe staples and rarely budge. I am a virtual stranger to the fashion "knock-off". That was, until yesterday. That's when I saw the beautiful Cate Blanchett on the red carpet, at the launch of the Screen Worlds exhibition in Melbourne. She was wearing a statement piece. 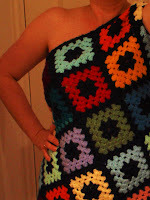 A garment that said crochet; with a nod to the the iconic granny square, that we novice crocheters so love. I thought it was fun. And just had to get my hands on one. But as is so often the case, the rushed copy is never quite the same. The fit seems a little odd. What do you think? Cate's got nothing on you baby. Nice! If it makes you feel good, I think you look better in your granny rug than Cate did! Definitely a much better fit on you! That is the coolest! I saw Cate Blancett on TV this morning and thought of all the crocheting all the blogging people have been doing, i think she looked super cool! The people who are saying it is a fashion tragedy don't know what they are talking about! Yay, for the granny square. I'm crocheting them at teh moment. I feel so cool now! i saw this in a mag last week (think it was marie claire) and almost died at the thought of wearing my snuggle blanket as a dress. THEN saw it on kate WOW! still not sure if i like it as a dress, but it is definately an interesting new fashion trend. Yours beats Cate hands down any old day! You make me laugh. Do you need one of us to come around and stitch you up. You've got the fitment absolutely perfect! Cate's looked a little dumpy with the squares perfectly horizontal and vertical. They needed to be on an angle to show the beautiful body curves. i agree with Cam, better on an angle. Hoppo Bumpo definitely wins in the fashion stakes. Smaller squares on the diagonal are much more flattering. I like your interpretation MUCH better! Yours looks waaay better because your squares are on point. You rock the look !!! Just the thing for if you fall asleep at a film premiere ;) Did the diagonal, I like yours better too! Yes, yours looks like much better crochet and I thought Cate's was ruined by the (single) long sleeve. Fab! Good on Cate, she obviously appreciates art and crafts people..